We are proud to announce our GOLDEN SPANNER award. 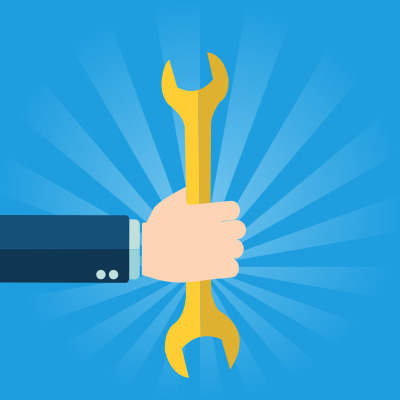 We have decided at the end of every month to award the GOLDEN SPANNER to a member of staff who is chosen by the team. Every month we all put the person we choose into a draw and obviously, the winner is the person with the most votes. The award is given based on a few simple factors, yes everyone here works hard, but sometimes certain members of staff do that something special or go that extra mile to help, and for that we will be rewarding them with a £100 bonus, and a place on our GOLDEN SPANNER wall of fame! Luke has been the stand out member of the team this month, so much so he gets to lift the prestigious Golden Spanner award! Luke has been with us for just over 6 weeks, but his tenacity and excellent work ethic has left us wondering what we ever did without him. A massive well done luke from all of your colleagues at the Lodge. Rob Lee (the legend) is becoming a veteran of the Golden Spanner world, winning it first the very month after it was first conceived. Not only is Rob a very popular staff member, but not a day goes by when a customer isn’t singing his praises. Rob is one of those rare people that is a pleasure to know, and rarely gets flustered no matter what the occasion or event. 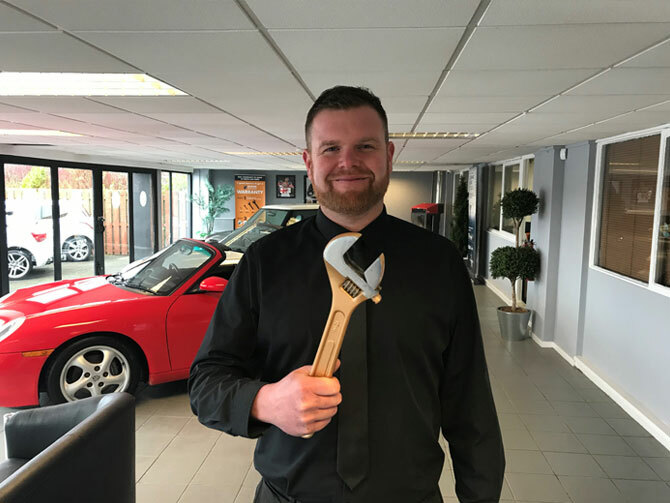 The help Rob has given to his Sales and Service colleagues not just this month, but every month makes him the runaway winner of the Golden Spanner yet again! Well done from everyone at Redgate Lodge. Enjoy the bonus. A newcomer to both Redgate lodge, and the Golden Spanner. Joe is this months award winner! Joe is our site maintenance technician and can turn his hand to anything. This month Joe has assisted every department from Sales, Service and Accounts, Right through to Bodyshop and Car Spa. His meticulous attention to detail and his eagerness to help his colleagues has really left us wondering what we ever did without him! A very sincere thankyou, and a very well done from team Redgate. Enjoy the Bonus Joe. 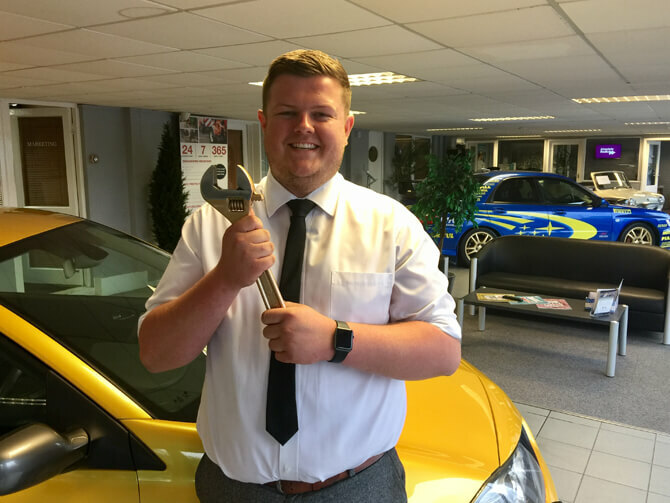 For his second time in 6 months, Josh lifts the prestigious Golden Spanner award. 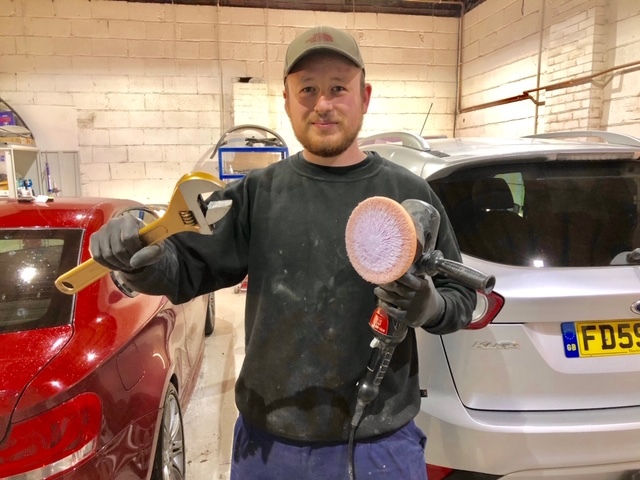 Josh can be found darting around our workshop, often working on multiple cars at the same time as well as helping and supervising his less experienced colleagues. January is one of our busiest months of the year, and had it not have been for Josh and his tremendous contribution, the month certainly wouldn’t have went so well! A huge well done form all your colleagues Josh. Enjoy the bonus! Our first 2nd time winner this month as Scotty takes home the prize for the 2nd time this year. Scotty when above and beyond this month is his quest for perfection. 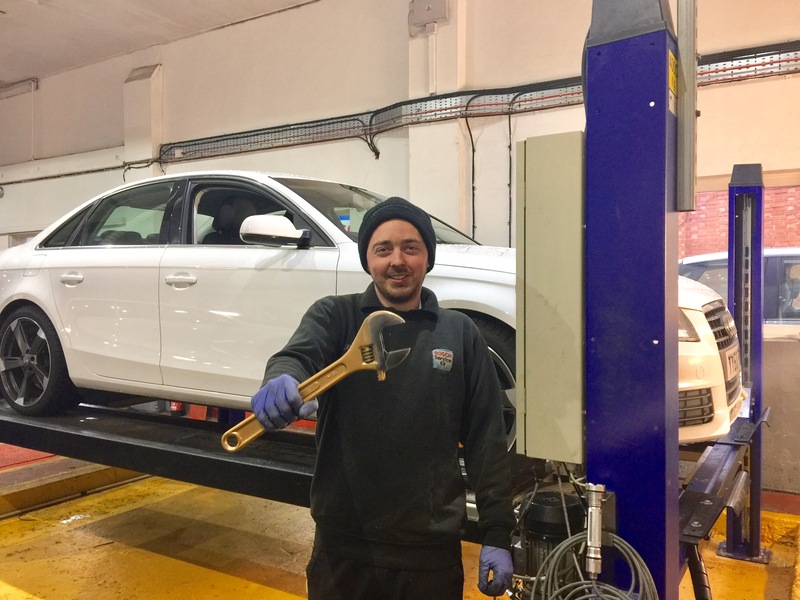 When the snow hit, Scotty was on hand to ensure the site was gritted every morning, heating was on for the showroom, cars were all defrosted and cleared of snow as well as running the Car Spa ensuring all cars hit the deadlines. 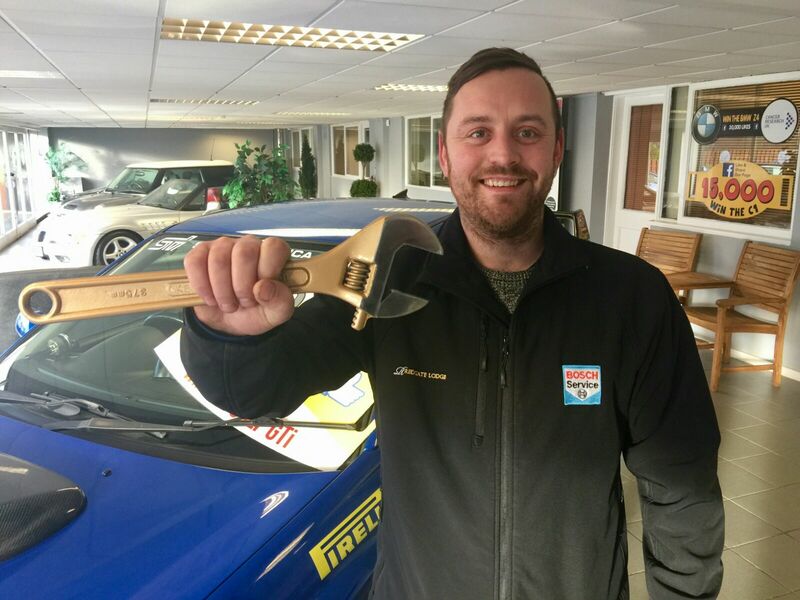 Very well-deserved GOLDEN SPANNER, congratulations Scotty! Stew has taken the GOLDEN SPANNER after a fantastic month at The Lodge. 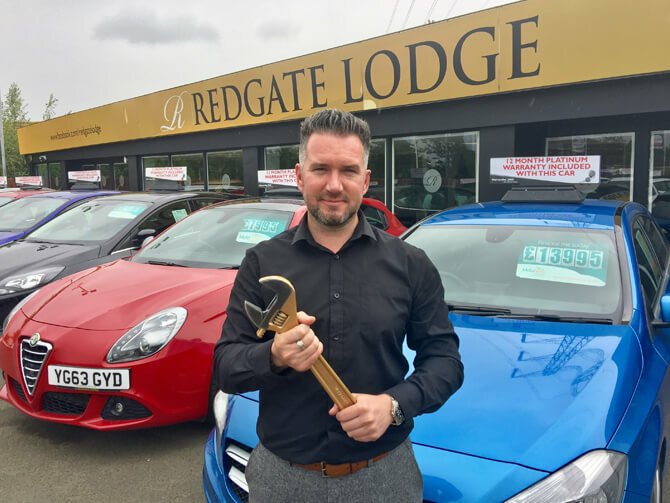 Stew recorded record sales in what was a record month for Redgate Lodge which is worthy of this accolade alone, but there’s more…Stews fantastic attitude and unrivalled knowledge of the motor trade have really shone this month. Enjoy the GOLDEN SPANNER bonus Stew! 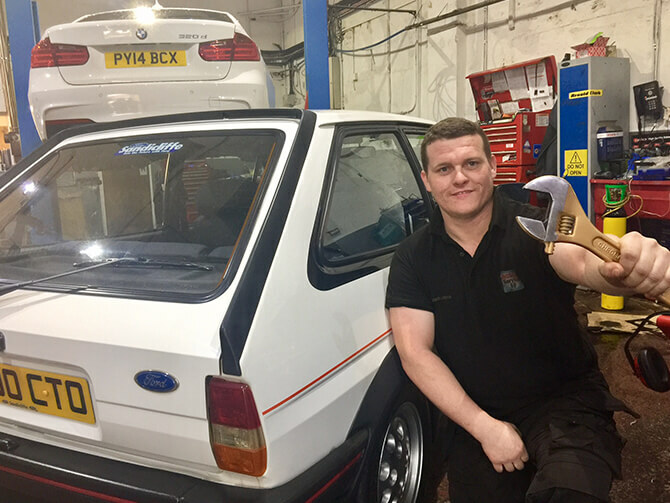 This month’s deserving winner of the GOLDEN SPANNER award is body shop apprentice Saif. Saif joined the Redgate team in October and has fit in like he’s been here for years! Saif has already impressed with his amazing attitude to work and his incredible knowledge and techniques. 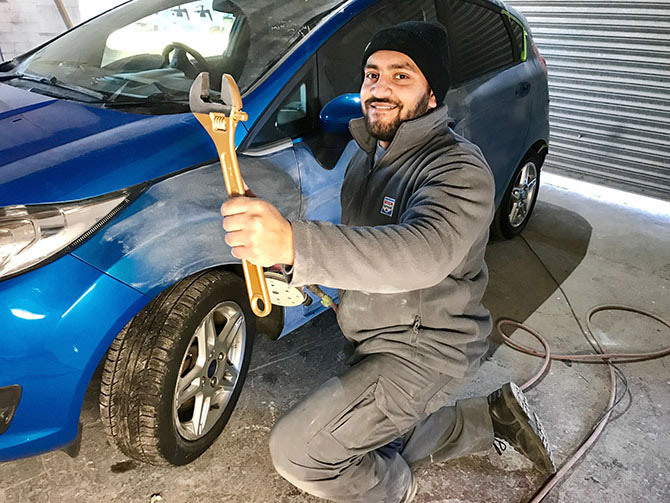 For someone so young and new to the trade, Saif can be left to get on with his own jobs, working unaided and to the highest standard. We are delighted to have Saif on our team and he is a real asset to the body shop. Picking up the GOLDEN SPANNER is Andrea from Accounts. 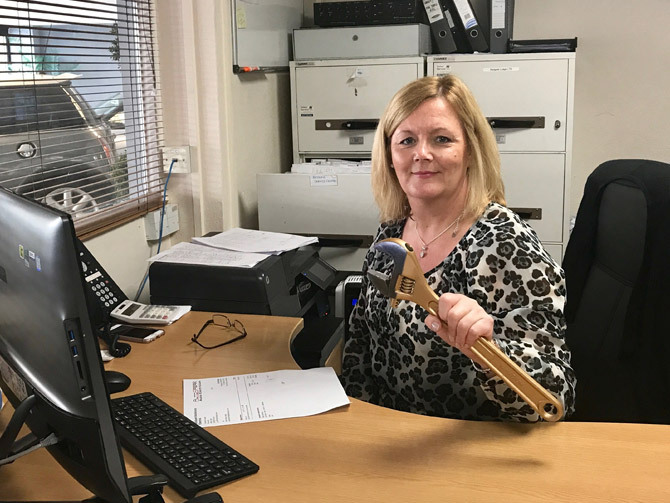 Despite only being with Redgate for a matter of months, Andrea is already making a host of positive changes to our processes and practices which is driving Redgate Lodge forward. Straight talking Andrea has whipped our Accounts department in to shape, added new processes for Sales, Service and the Body Shop, introduced monthly management accounts and all this was done while moving into her new house and helping her niece settle into university!!! Andrea has settled in to The Redgate Family almost as though she's been here forever and we are extremely excited about the future! 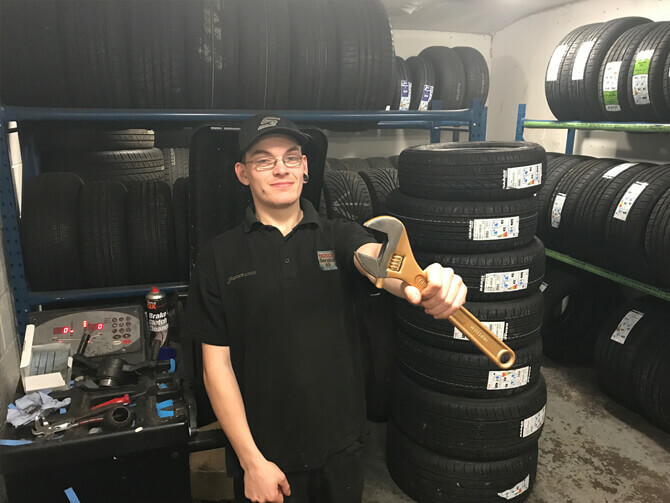 Apprentice Mechanic Liam a.k.a The Jock, is the deserving winner of the GOLDEN SPANNER award. The Jock wins this award for the marked improvement in his work, his greatly improved attitude and his continued willingness to learn, which is extremely important for his future success and the success of the garage. 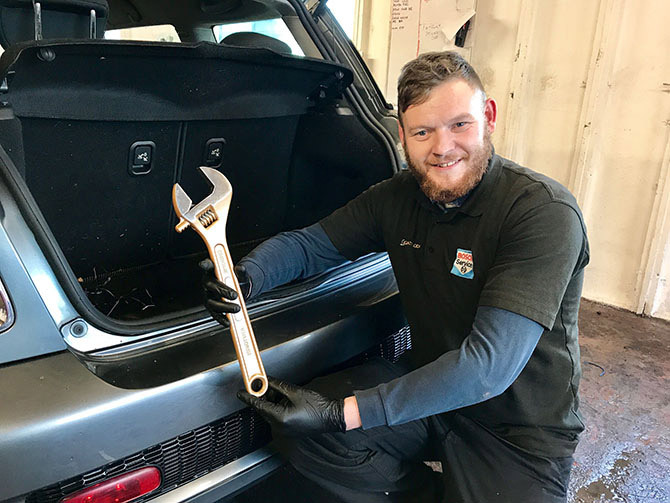 Liam has entered the final year of his Vehicle Maintenance and Repair Apprenticeship and we have seen a huge improvement, especially over the last few months. We hope this continues until the end of his course and he qualifies to be a fantastic mechanic, which he has the potential to be. A hugely knowledgeable young man with a real love of anything Honda, a very deserving winner this month! Junior, as he’s known to most of the Redgate Team collects the GOLDEN SPANNER award. 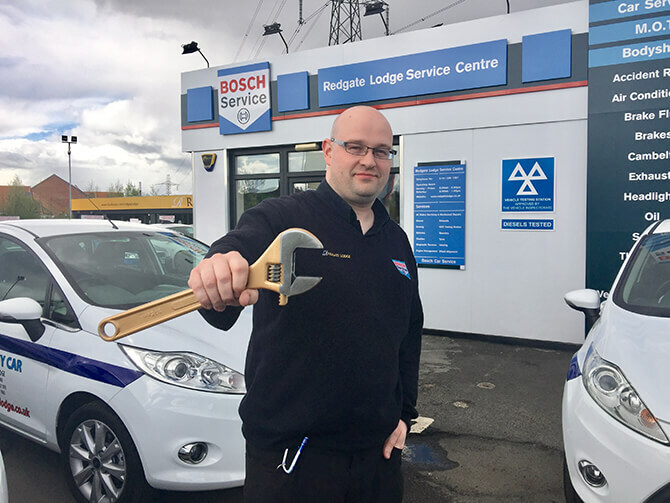 A newby to not just to sales, but the motor trade in general Sam has previously been a real unsung hero here at The Lodge….that is until now. After some whole-style changes at Redgate, Sam has now been able to flourish and really proving how much “behind the scenes” work he really does. The most likeable man your ever likely to meet, Sam greets everything with a smile and a cheery hello. A hugely important member of the team and no one is more deserving of this GOLDEN SPANNER accolade. Congrats Sambo, spend you £100 wisely. The winner of the GOLDEN SPANNER is The Godfather of Soul himself, the man, the legend, Mr James Brown. 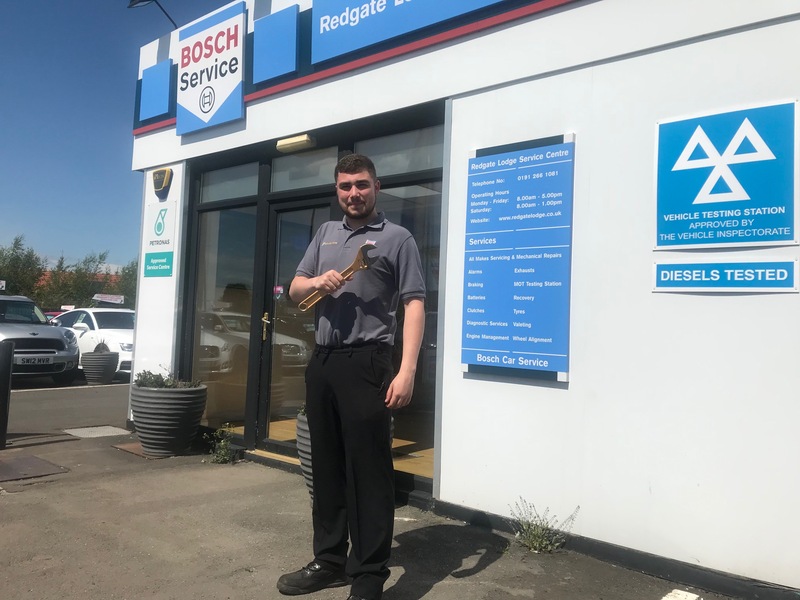 James’ experience in the motor trade and brilliant attitude to the job in hand, coupled with his vast amount of useless information, make James an extremely important member of Team Redgate. Over the month of June, James has helped to identify a problem within the running of the business. Following his input, we have been able to innovate, improve our structure going forward and create a stronger environment for both customers and our staff. Good work agent Brown! Enjoy your prize. Congratulations to the winner, shy and retiring Gaz!! Gaz has been and absolute machine this month, powering through sales cars like a machine. Always laughing and joking (mostly terrible jokes), Gaz really keeps the sprits of the workshop up and he is an complete joy to have around. Gaz has really embrased some changes we have made to the workshop this month with his postive attitude wearing off on everyne. LETS GO CHAMP. Alan the body shop manager has taken home the Golden Spanner award, and the £100 bonus. 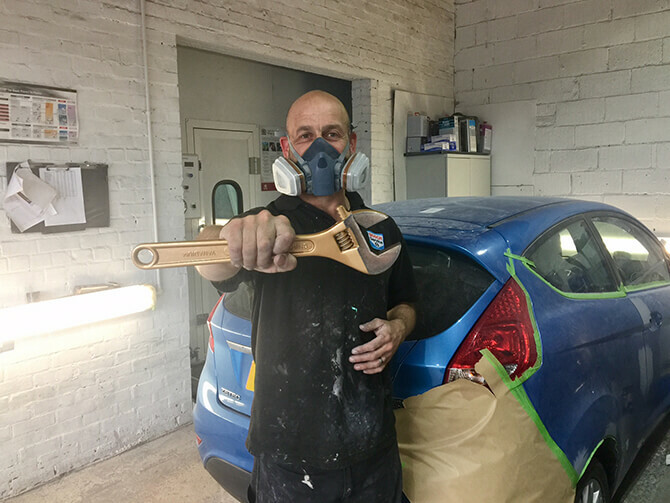 Alan has had a non-stop month, painting and prepping for both customer jobs and our sales cars, every car has been delivered on time and the work faultless. 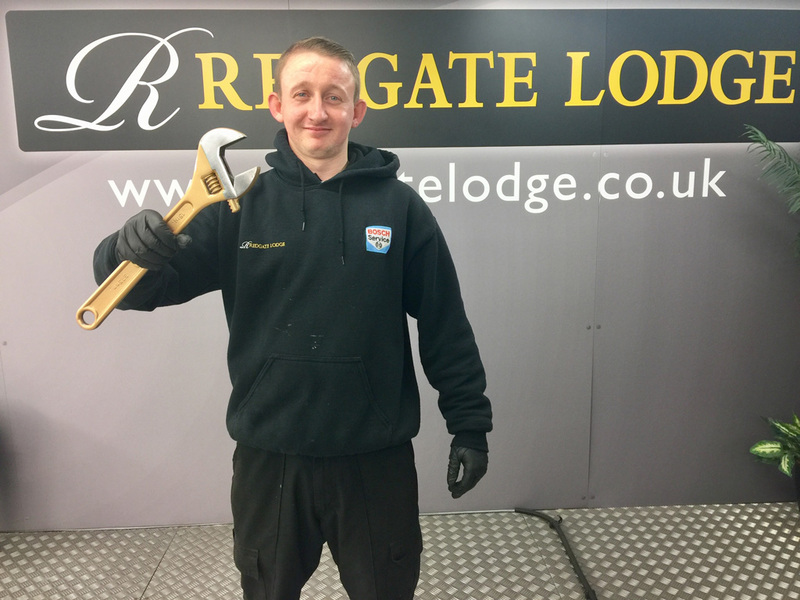 Alans quality of work and attention to detail and are a real asset to us here at Redgate Lodge. Well done Al, enjoy your bonus! John (aka Ryan) is our winner for our Golden spanner award. 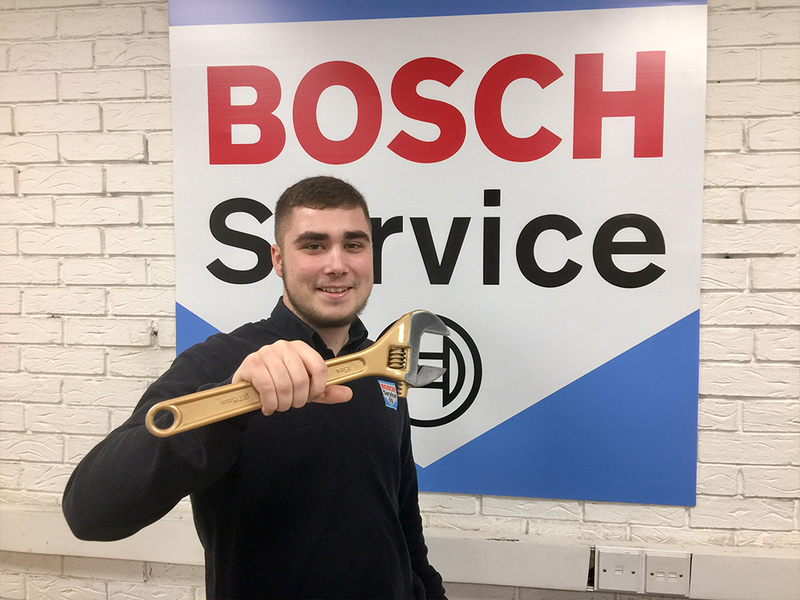 Ryan has Worked in the Bosch service centre since October 2016, and in his short time with us has displayed a knowledge that cannot be rivalled. Ryan has forgot more things than most people know, and never fails to surprise the team by rattling of a part number, or diagnosing a car within seconds of hearing a symptom, his mechanical knowledge simply phenomenal. Ryan is the type of guy that every company should be proud to have, and we certainly are. Well done Ryan, and enjoy your very well deserved £100 bonus! 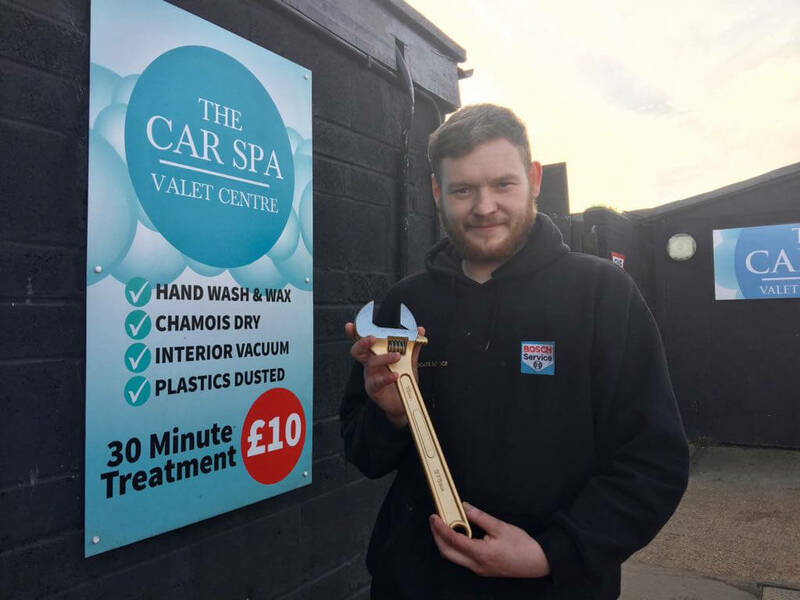 Our Golden spanner winner goes to non-other than Scotty, our Car Spa manager. Always there to lend a hand to the sales and service department, Scotty was always going to win a Golden spanner award at some point due to his nonstop attitude when it comes to work, he is always there to help regardless of how busy he is, and it is for that reason alone he was the standout winner for this month. Congratulations Scotty, enjoy your bonus! 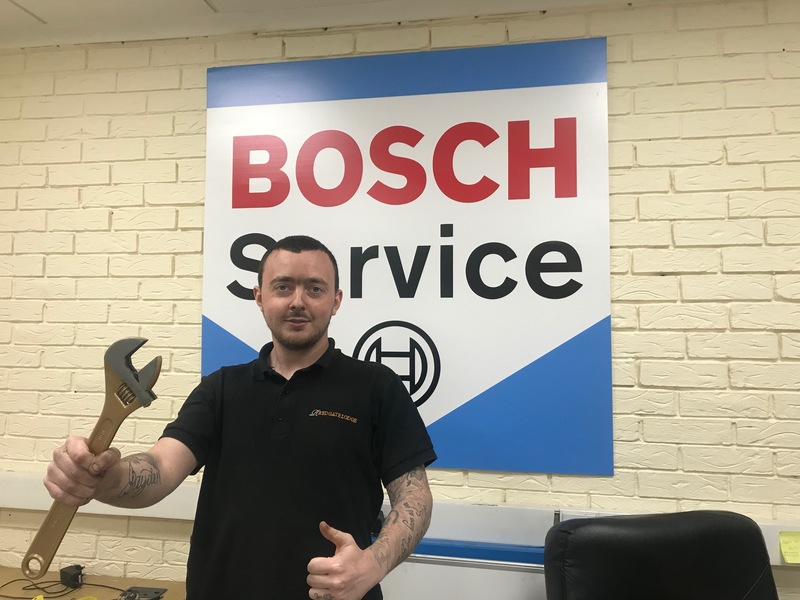 With a record number of staff members voting for him, this month's winner of the Golden Spanner Award and £100 bonus goes to Josh in our Bosch Service centre. Josh has been quite simply an amazing member of staff to have on hand, literally dropping whatever he was doing to help anyone, and everyone out in the month of January, and has continued that into February. 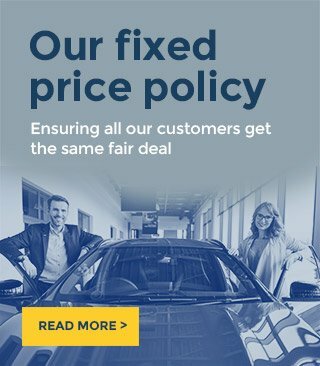 In a record month from the sales side where over 100 cars were sold and delivered it would have been easy to get frustrated and cave under the pressure, but josh quite simply shone all month long, putting in more overtime than anyone and digging deep to help the team out, every time with a massive smile on his face and a nothing to much trouble attitude. Josh congratulations and well done, you fully deserve the limelight and the bonus sir! This month’s Winner is Stephen, better known to the Redgate Lodge Team as Vasey! Always to be seen with a smile on his face Vasey was a unanimous winner, and it was only a matter of time of when not if he won the award. Always there to lend a hand to any department Vasey never questions why, or is too busy. If you need his help he is always there, with a big smile on his face. 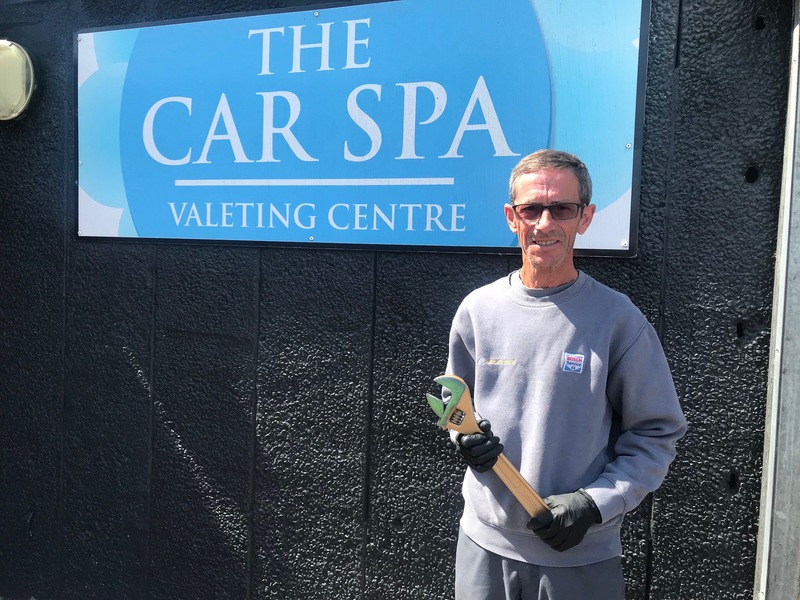 Our winner of the GOLDEN SPANNER AWARD goes to Rob Lee (The Legend) Having been a key part of the service centre for over 3 years now is was only a matter of when not if Rob Lee won the award. Always working with a smile on his face Rob Lee has been a stand out performer in the month of November, and is always on hand to help whenever and whoever needs him. Congratulations Rob lee, as we have always said you are a true Legend!! The first award in Redgate Lodge history goes to James in our valet department. James came to our rescue last week when he was due to take a weeks holiday, however due to us being extremely busy at the last minute James cancelled his week off and has showed us just how valuable he is to the team.